Children undergoing a variety of neurosurgical procedures present a unique set of challenges to the anesthesiologist caring for these patients. 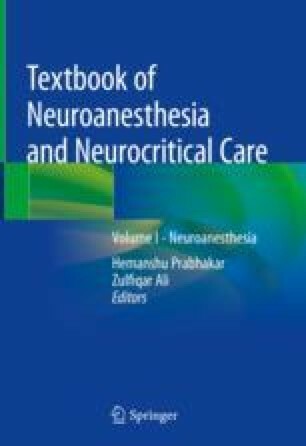 Anesthesiologists must have a clear understanding of not only basic human neurophysiology but also normal and abnormal human motor and cognitive development. Children are not simply small adults, as evidenced by differences in pharmacokinetics, pharmacodynamics, physiologic responses to varying normal and pathologic situations, and demonstration of allometric scaling. Application of these principles informs good clinical care of children for surgical treatment of neurologic disease. This chapter will highlight these aspects of essential clinical care. Further, aspects of pediatric care including discussions of current thinking on cerebral autoregulation, anesthetic induced neurodegeneration, and common clinical situation in pediatric neuroanesthesia will be highlighted.